Honey Dijon Pork Tenderloin is flavorful and tender and requires only a little effort on the part of the cook. It is sure to be a hit as an easy weeknight dinner or as a weekend meal that your family and friends will all enjoy. Pork tenderloin is one of the most foolproof proteins you can make in the kitchen. Because it already has the name “tender” in its title, you can rest assured you’ll be serving a cut of meat that will be easily sliceable and incredibly moist from end to end. Since tenderness isn’t the issue with a pork tenderloin, it’s the flavor which can sometimes be lacking. 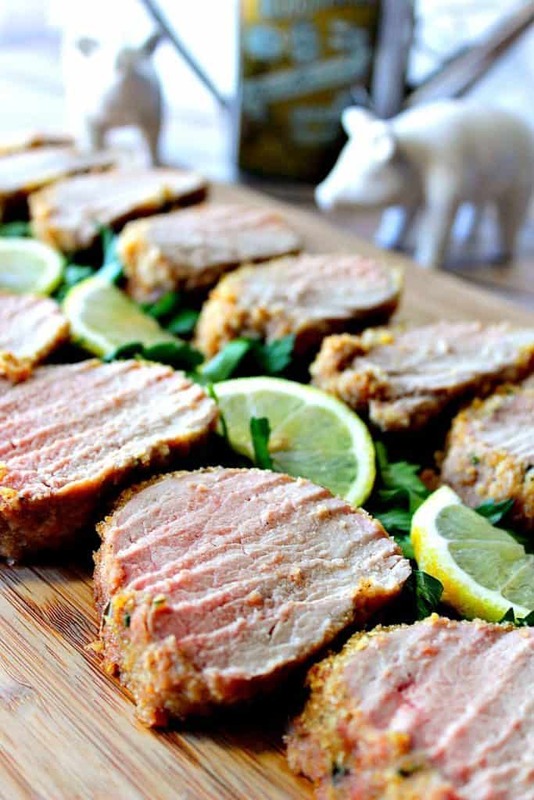 This Honey Dijon Pork Tenderloin with Breadcrumbs & Lemon is anything but bland. You’ll love the tiny hint of sweet from the honey which marries well with the mild flavor of the Dijon mustard and fresh zest of lemon. The ingredient list for making Honey Dijon Pork Tenderloin with Breadcrumbs & Lemon is basically everything the title entails. You’ll need a 2-3 pound pork tenderloin (not the flavored variety), honey, Dijon mustard, breadcrumbs (plain or flavored), fresh lemon zest from one lemon, salt, pepper, garlic powder and olive oil. Chopped fresh parsley is a tasty addition if you’d like to mix it in with the breadcrumbs, but that’s it. Ten total ingredients and all of them are probably already in your pantry, freezer, and fridge! 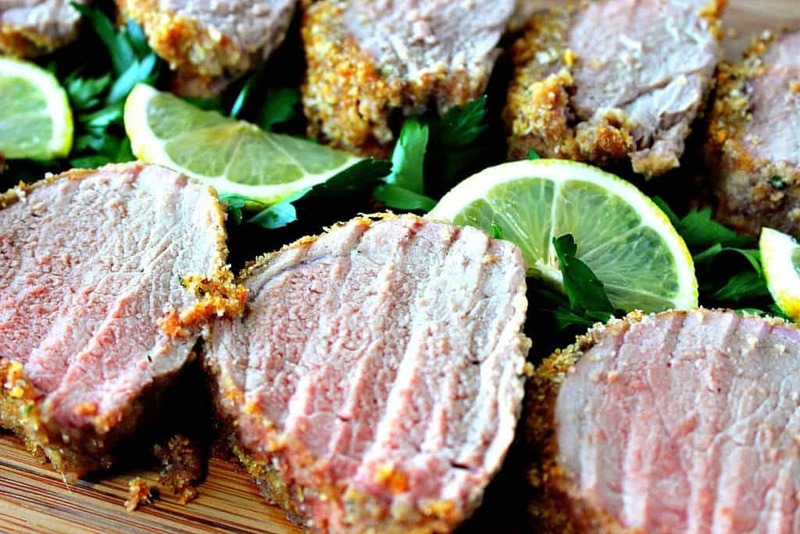 The time it will take you to make Honey Dijon Pork Tenderloin with Breadcrumbs & Lemon is roughly 50 minutes. Once you’ve coated the tenderloin with the honey Dijon mixture and rolled it in the seasoned breadcrumbs, the oven does all the work so you can go about your business until it’s din din dinnertime! 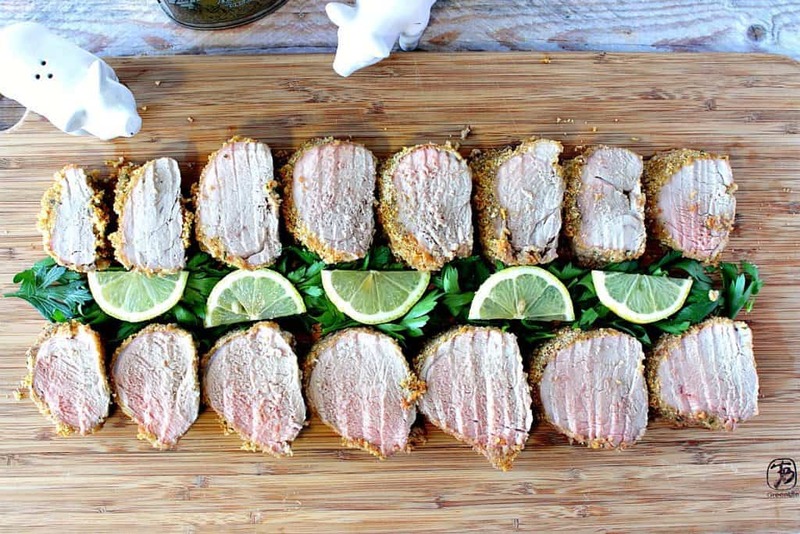 This Honey Dijon Pork Tenderloin will feed approximately 6 people with two slices each. However, you can feed even more people depending on how thickly you slice the meat. My husband is always the slicer of our family, and he likes his pork tenderloin slices about 1″ thick. In a shallow dish mix together the breadcrumbs, parsley, lemon zest, garlic powder, salt, and pepper. In a small bowl stir together the honey and Dijon mustard. Use paper towels to pat the pork tenderloin pieces completely dry. Brush the honey Dijon mixture liberally over each pork tenderloin piece. Roll and press each honey Dijon coated tenderloin piece into the seasoned breadcrumbs and then transfer the breadcrumb coated tenderloins to a baking dish that has been sprayed with olive oil or cooking spray. Drizzle olive oil over each tenderloin piece and roast in a 350 degree preheated oven for 45 minutes. Remove the cooked tenderloin from the oven and allow to rest for 5-10 minutes before slicing and serving. Dry the pork tenderloin pieces well with paper towel. Set aside. In a small bowl stir together the Dijon mustard and honey. In a shallow dish, mix together the breadcrumbs, parsley, lemon zest, salt, pepper, and garlic powder. Brush the Dijon and honey mixture liberally onto the pork tenderloin. Roll and press the honey Dijon coated pork tenderloin into the seasoned breadcrumbs to coat. Place each coated tenderloin into a baking dish that has been sprayed with olive oil spray or cooking spray. Drizzle the pork with the olive oil. Roast in the preheated oven for 40-45 minutes (or until the internal temperature of the pork reads 145 degrees on an instant-read thermometer). Remove the pork from the oven and allow to rest for 5-10 minutes before slicing. 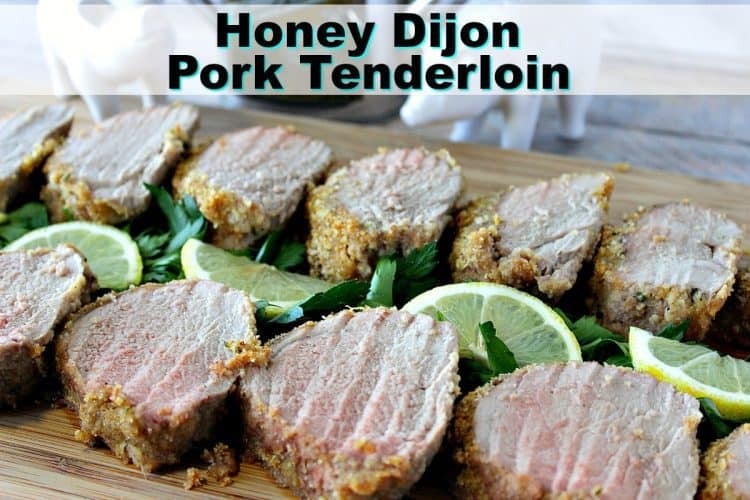 The following Amazon.com items are suggestions from me if you’re in need of any of these items which will help you make this recipe for Honey Dijon Pork Tenderloin with Breadcrumbs & Lemon. You are under no obligation to purchase or click on any of these items. 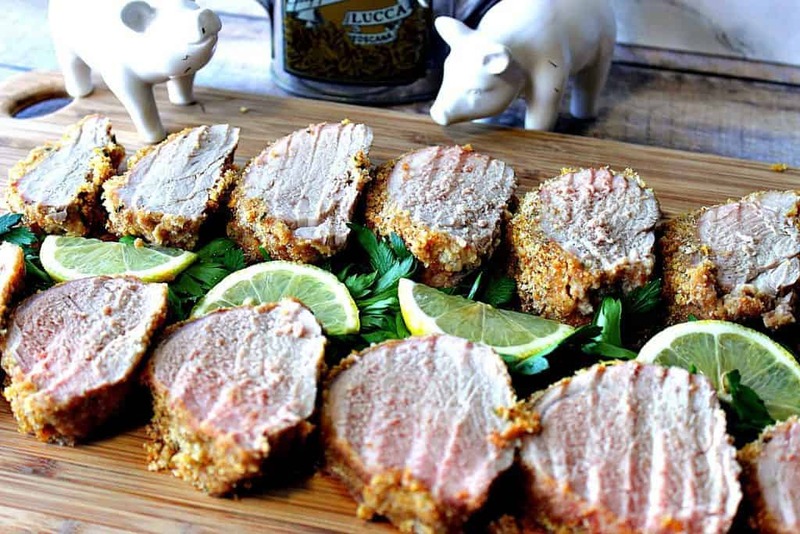 I hope you’ve enjoyed today’s recipe for Honey Dijon Pork Tenderloin with Breadcrumbs & Lemon as much as I’ve enjoyed bringing it to you! Should have any questions regarding this post or anything else you see on my site, please don’t hesitate to contact me directly, or leave me a comment in the comment section below. It is always my distinct pleasure to get back to you with a reply just as soon as I possibly can! The post above includes affiliate links. When I find a great product or service, I like to share it with my readers. Sometimes I use affiliate links so I can earn a small commission for my recommendations. As always, I thank you for your support!